Sunglass frames with a twist, Sunskis compliment any face shape and complexion. Durable polycarbonate frame, polarized lenses, and five-spoke hinges that aid against sides snapping off. Comes packaged for gifting. 1% of all Sunski purchases go to Leave No Trace and Save the Waves. Great quality and I get asked about where I got them. Get lots of comments on these glasses - and in certain light, they make things really 'pop' and look amazing. Very happy with these. I've had these for about two weeks, and I love them. Excellent clarity, very light so comfortable to wear, polarized even at this price, and dark enough to be effective. The reviewer who said they aren't dark enough must have gotten a defective pair. Much better deal than the famous brand name monopoly products. These are perfect: they fit well, they are dark enough, and they are very sturdy. First they came up with the Salsabol—a bowl with a lip to help salsa lovers get the most out of every dip. Now, Tom Stewart and Michael Charley have given new life to vintage Australian wayfarer sunglasses. With vibrant pops of color, polarized mirrored and tinted lenses, plus quality construction through and through, Sunskis are a fresh take on a retro-cool classic that are thoughtfully designed and surprisingly affordable. In fact, it was during a surf trip on a shoestring budget in Australia that Tom first came up with the idea. Two years later, Tom and Michael launched their first Sunskis with clear rims and your choice of four colored arms and lenses. Fans of the sunglasses clamored for more and a new style was born. Introducing the Matte Black Sunskis with 5 spoke aluminum hinges for durability and enhanced polarization for even better clarity and reduced reflectivity. 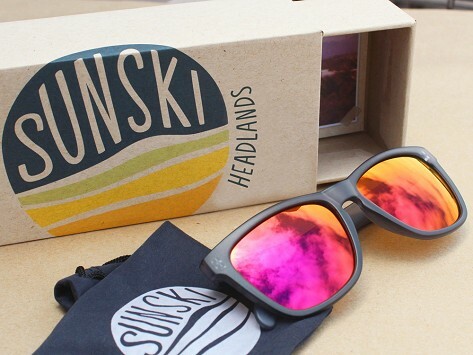 Sunskis brings new meaning to looking at life through rose-colored glasses. Through what color lens will your life look best?